Fabulous 5th Grade Fun: To Do List -- Be Gone! 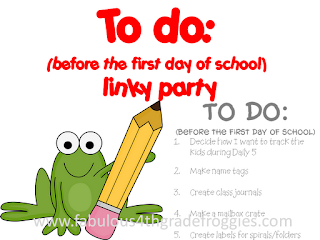 I'm linking up with Fabulous Fourth Grade Froggies' linky party. Summer is ticking away. Here are some of the things that I need to get movin' on! Clean out my 2 file cabinets...Do I really need all that stuff? Make crate seats for my new low table. Make and laminate cute "Hollywood" themed math station signs. Investigate Edmodo...Do I want to use this site with my students? I have to stop! This list could keep on going! I will just drive myself nutty if I keep listing. The plus side to the list is that I can go to my classroom at any time to take care of these items. Last summer, our school was under major renovations. We were allowed in a few days before our first day for teachers. Then, it was all about finding your things throughout the school. It was a mad scramble! The plan of action...check off a few a day. Starting with the driver's license! Right now...it's all about family, pool time, friends, reading and relaxation. What's on your list? Link up and share. Hi Charlotte! Thanks for linking up to my linky party!I hate having to renew my divers license. It's always a four or five hour wait at the DMV! Just found your site through Fabulous 4th Grade Froggies Linky Party! I am your very first follower!! I hope you can drop by my blog soon. I'm so glad I found a fellow 5th grade teacher! I found your blog through Fabulous 4th Grade Froggies Linky Party. Come on over to my blog! I'm a first year teacher so I feel like I have a ton to do even things I don't KNOW to do. I forgot to put a book I have to read before school starts on mine and saw a book on your list and thought of it.